Look, there’s really no way we can explain it better: “Welcome to ‘the Blister’ — a bizarre other-world colonized by humans sometime in the 22nd century, which quickly became a hotly-contested source of fertile land and natural resources long ago exhausted on Earth. 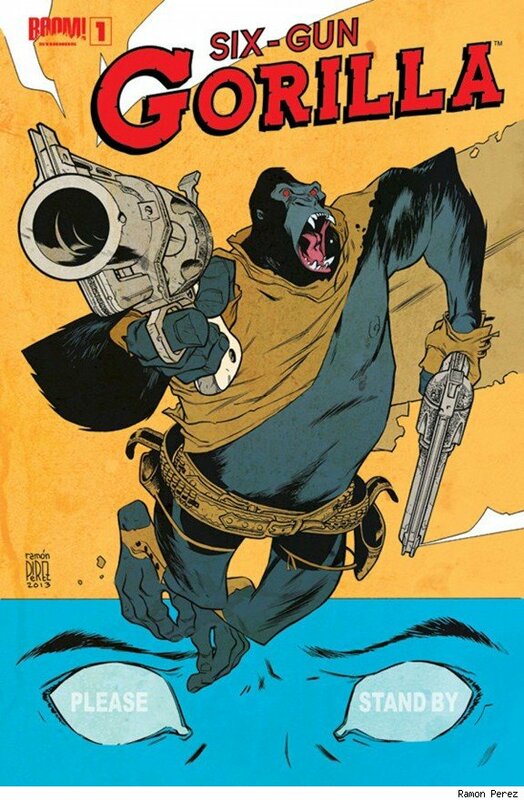 In this new frontier, a rogue gunslinger and his companion wander across a wilderness in the grips of a civil war, encountering lawlessness, natives, and perversions of civilization in a world at the crossroads between the past and the future. 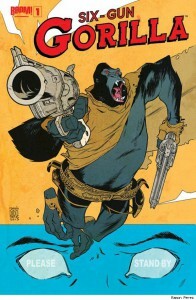 The fact that said gunslinger is a bio-surgically modified silverback gorilla toting a pair of enormous revolvers is neither here nor there.” That’s the story of Six Gun Gorilla from Boom! Studios, coming this June. It’s written by Simon Spurrier (X-Men: Legacy) with interior art by Jeff Stokely (Fraggle Rock, The Reason for Dragons) and featuring a cover by Eisner Award-winning artist Ramón Pérez (see below). The story behind the comic is even more interesting: It’s based on an obscure 1930’s comic which no one seems to know the source of. Major Spoiler’s write-up might make it all easier to follow. Or not.